the link we sent to your email. Sharing below link with a person will let them view the same configuration you have on the screen. However, they will not be able to access your shopping cart or account information. 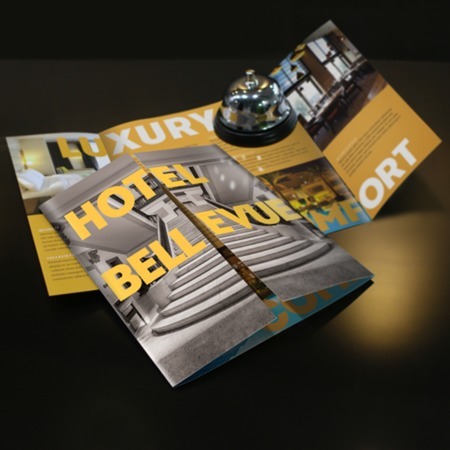 Gate fold brochure is a three-panel print that has two opposite sides folded to meet at the center. The folded size is wider than a standard tri-fold brochure and the paper opening provides a more creative effect on your design. The most common size for gate fold brochure is 8.5” x 11” and 8.5” x 14” — which folds to 8.5” x 5.5” and 8.5” x 7”, respectively. Need a different size? Here at UPrinting, you can customize the dimensions of your gate fold prints to fit your marketing needs. Download our free templates as guide in creating your layout. Our standard turnaround time is 3 days; but we can print them in 1 business day. Call us at 1-888-888-4211 or chat with us for assistance! Save time by using our free templates. Our templates have been setup with proper bleeds and margins, assuring your print job turns out accurate. To download, select a file type and click on the size below. 500,000+ customers trust us every day because we deliver great products. Here's why they trust us and keep coming back. With UPrinting you can rest assured that your print product will turn out right the first time. We offer superior quality printing all backed by our 100% quality guarantee. Don't compromise on quality and see the UPrinting difference! Uprinting is proud to offer our superior quality printing at the best possible price. We continually strive to provide our customers with the best instant pricing available through our easy to use website. UPrinting offers some of the fastest printing turnaround times found online. With its 1 day turnaround option you can have your product printed and shipped within 24 hours*. Local pickup is also available in the Los Angeles area. Have a question or need help placing an order? We're here to help! Our printing specialists are available 24 hours a day Monday-Friday and from 8am-5pm PST on weekends! Protecting the environment, our customers and our employees is one of our highest concerns. To do this we use vegetable based inks with low VOC emissions and offer paper options that contain up to 55% postconsumer recycled content. Get your files proofed and checked for errors without paying a cent. We're so confident in the quality of our printing that we provide 100% free proofing. No order commitment or credit card is required!